LHLink is a pivoting, easy-to-use front linkage which improves the work efficiency of a machine and allows the driver to concentrate on the implement. LHLink increases productivity by 25 to 30% by making it possible to get the work done in a single run. 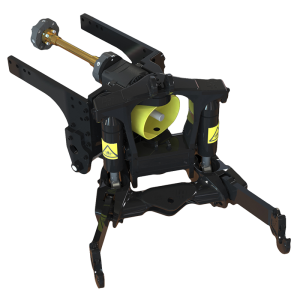 LHLink can be equipped with up to 3.5 tons of lifting power. 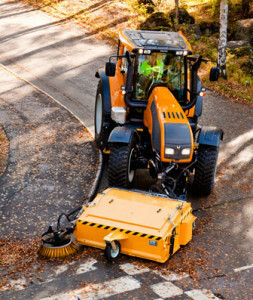 LHLink is especially useful in field mowing and in road maintenance and property maintenance tasks where LHLink makes it easier to see where the mowed or cleaner area ends or begins. 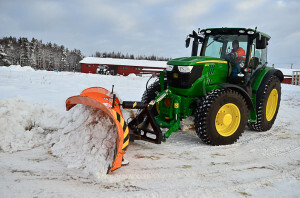 It is also possible to attach truck forks to LHLink, after which LHLink can also be used for warehouse work, making it easier to pile up bales or pallets to a more compact space with higher precision. A driver who uses an implement attached to a tractor’s front linkage with LHLink is actually driving the linkage and not the tractor. Thus, LHLink improves the control of the combination and precision of work. 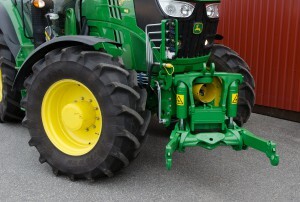 turn more than the front wheels, making it easier to work with the implements attached to front and back linkages. LHLink front linkage turns according to the tractor’s front wheels. The turning ratio in relation to the front wheels and deflection from the middle line can be set with two easy adjustments. LHLink is controlled automatically and electro-hydraulically according to presets, allowing the driver to concentrate on driving. LHLink Manual includes exactly the same pivoting features as LHLink but turning and lifting the linkage is done with a joystick.